(Newser) – A reprieve for former Virginia Gov. 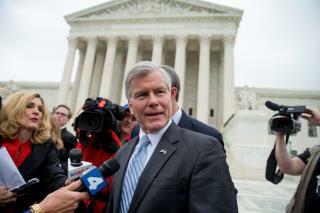 Bob McDonnell, and, perhaps, for elected officials accused of corruption in general. A unanimous Supreme Court on Monday overturned the bribery conviction of McDonnell, who was in 2014 found guilty of taking more than $165,000 in gifts—including a $6,500 Rolex—and loans from a wealthy businessman in exchange for promoting a dietary supplement. He was sentenced to two years in prison, but was allowed to remain free while the justices weighed his appeal. (A federal appeals court unanimously upheld the conviction last year.) The justices voted to narrow the scope of a law that bars public officials from taking gifts in exchange for "official action," saying it does not cover routine courtesies like setting up meetings or hosting events for constituents, the AP reports. So I guess Jack Abramoff went to the slammer for nothing. He should ask for his money back. Go figure most GOPER's are on the take. This is why I cannot fault a man to go against his government or to out right kill a public official. SCOTUS just proved who they work for & to me they are no better than MOB enforcers. So does this mean that POS trying to sell Obamas senate seat is getting off?